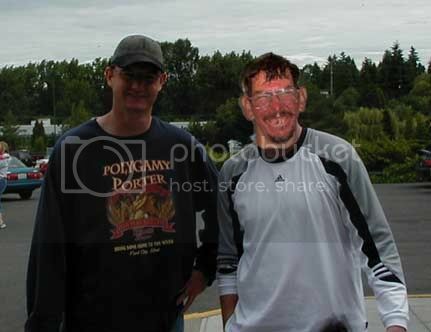 Here's a photo from our lunch when I had the pleasure of meeting Odin_Hammersong at the end of July 2005. Man I must have been drunk or something, I swear he is better looking IRL! Not much but, better than that! Yeah the waitresses were all over him when we were eating lunch. A real ladykiller. Let's see the rest of you! It would be nice to put a face to a player....come on...post your pics here! You've been gaming with a sexah ugly-faced cat angel this whole time. Hey guys...I guess I should reveal the beauty that lies beneath Scel's rough exterior. Be kind...remember, a beautiful heart more than makes up for me being oogly. Last edited by Druid523 on Mon Sep 29, 2008 5:03 am, edited 2 times in total. Is that your thumb in a milk jug...? Last edited by Lir'ana on Sat Jun 09, 2007 12:46 am, edited 2 times in total. Cal and Lir...miss you two. Wow. WAY more hair than I expected!